Bhāī Wīra Siṅgha, jīwana te racanā. Satindara Siṅgha. Paṭiālā : Pabalīkeshana Biūro, Pañjābī Yūnīwarasiṭī, 1982. From the University of Chicago Library. ਭਾਈ ਵੀਰ ਸਿੰਘ: ਜੀਵਨ ਤੇ ਰਚਨਾ Vir Singh Bhai: Jivan Te Rachna by ਸਤਿੰਦਰ ਸਿੰਘ Satinder Singh. 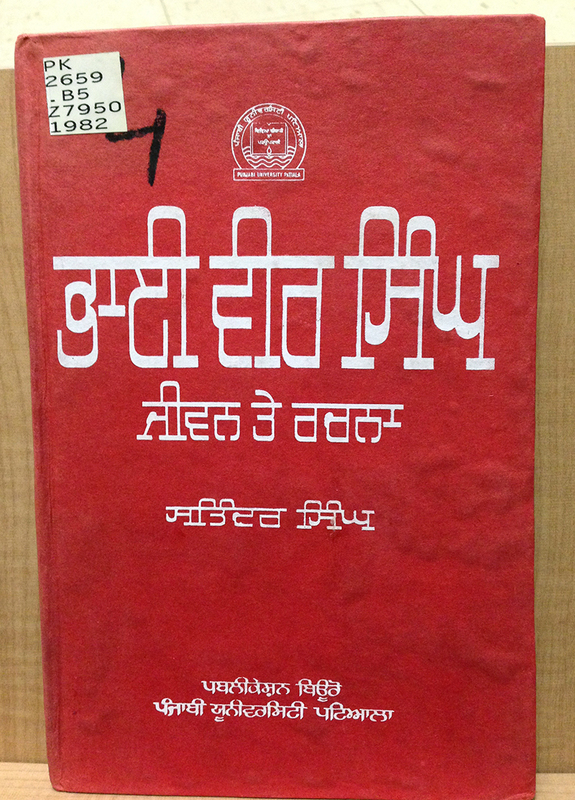 This is a book about the life and work of Vir Singh, poet, scholar, and theologian of the Sikh revival movement. His contributions earned him the honorific title of “Bhai”, normally given to those considered to be saints int he Sikh faith. While Sikhs were being persecuted and pressured to assimilate by Hindus and the British, Vir Singh sought to revitalize Sikh culture through peaceful means, by writing novels, epics, and poems. The lettering of this cover uses the “reverse-contrast, slab-serif” style of Latin scripts. Looks very strange to me – note the odd attempt at a loop in ਭ and the foot on ਜ that required the artist to angle the form. Funny!